Thanks to Plum Organics for sponsoring my post about fun kid photos and the stories behind them. Enter Plum’s “Babies for Yum Caption Contest” on Facebook and you could win a $100 gift card or Plum goodies. I always thought it would be awesome to be a mom of boys. There just seemed to be something carefree about it. I think because boys can be stereotypically much more rowdy than girls, you just have to have a monster sized sense of humor to make it through each day. Plus, boys are crazy and silly and fun! I only had sisters and while we get along great, I always wanted brothers too. When I found out we were having a boy the first time I was pregnant, I had a mild panic attack and then quickly got right on board. A boy! Oh yeah and boys LOVE their mamas. I couldn’t wait. Of course the idea of raising boys usually brings to mind images of dirt (check), broken bones (check), gross habits (check) …. and unconditional love (check check check!) And now that I am having our second boy, I could NOT be more thrilled. This picture was taken back in April when Oscar was in his BOOTS phase. Everything about this picture is special to me. I think we were just hopping in the van to run an errand, so there he was in his pjs and rainboots. He was SO proud of those boots! Every morning at breakfast he would come downstairs and rediscover the boots. He would exclaim, Oscar can wear BOOTS and slip them on. I think he loved them in part because come on, boots are just fun, but also because he could put them on all by himself. He would dance and stomp around and wear them all day. This is what being a boy is all about if you ask me. 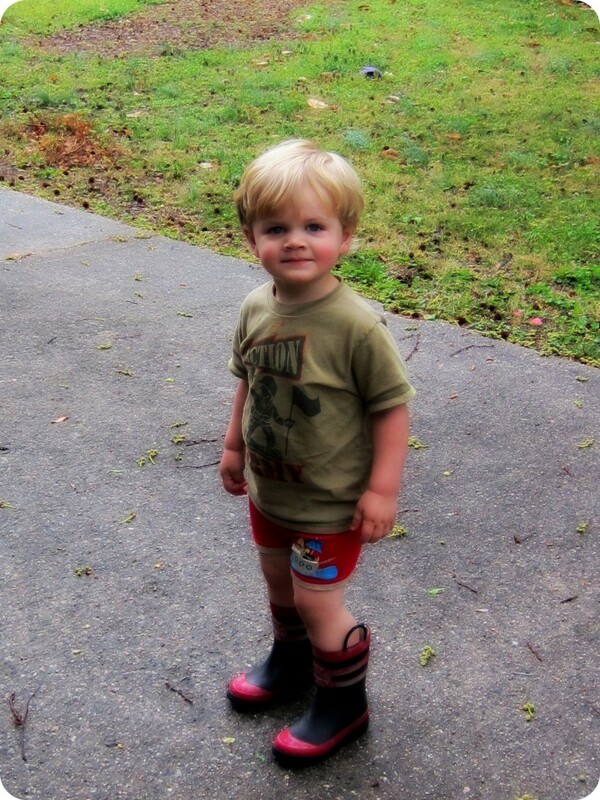 Not a care in the world but to have your favorite boots on and play outside. He has since moved on to bigger and brighter obsessions, like bubbles, Toy Story and various books, but there is just something about those boots that holds a special place in my heart. We have just entered the boot phase. JDaniel wants to wear them everywhere. My (now) 4 year old went through the exact same phase recently with a pair of Hello Kitty boots and now that she’s grown out of them I am so thankful for the fact that her big sister also had a pair so that in a year or so we can revisit the Hello Kitty boot phase, if only for a day. He is so cute. He should proud in those highly fashionable boots. Found you on twitter. under #cleverphotos I ran a CG post today too!